FYI I have an ATI Radeon 6570 and the update (from 2.62) didn’t like the X.org driver, it works ok with the fglrx driver. It sound very easy, i had been trying since a week now, to install ubunto 12.04 and blender on my machine i7 with Geforce 640 , have done many fresh install i dont even remember how many, always the problem is Nvidia and CUDA. i have followed your instruction three command line above, but it dose not starts clicking in blender icon it dash home disappears and in a later time it gives me crash message Blender has crashed unexpectedly . Works good- is there any way to set up Blender to accommodate Second Life Mesh and Sculpty files and issues such as creation of SL usable items without resorting to paying for things like Prmstar and Avastr? Builds from this ppa stoped working with OSS AMD drivers which is sad because they don’t have bugs on smoke simulation that fglrx has, antialiasing feature works, and atleast for me they’re faster especially object selection. 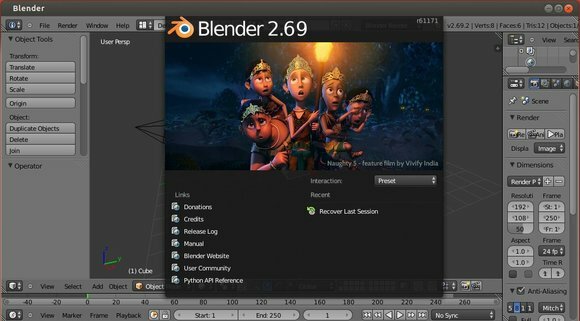 The PPA provides the latest build of Blender and now its 2.70 rc release.